After my proposal to guadec-list got a decent response, I think it’s fair to say that we’re good to go for a GUADEC table quiz! The table quiz will be one of the social events during GUADEC, I’ll be recruiting people to help with questions, corrections and livening up things. The details, obviously, all need to be worked out. For those of you from Ireland and the UK, you probably already know what a table quiz is (also known coincidentally as a pub quiz – probably because of the participation of the public). For the rest of you, here’s the skinny. People organise themselves into teams of 5 or 6 people, who then give themselves a team name to go with their table number. The quiz is organised in rounds of 10 questions, and I think we’ll run 5 or 6 rounds. Between rounds, fun and frolics can be expected with spot prizes, and fun will be had by all. Or else. Keeping up my “tradition” of del.icio.us saving all of the articles on the GNOME release that I find (tagged with gnome222). Tectonic follows up their “sneak preview” with an article on the release. I’m not one to make GNOME/gnome jokes, but this was too much of a coincidence to let it slide. Gnome sighted in Argentina on date of GNOME release. A collection of awesome things – many great ideas united in one place, an endless source of inspiration and time-wasting! I liked the “Home things” section. For reference: the announcement by Red Hat of the keynotes for their conference. Compare & contrast with our announcement of the keynotes for GUADEC. Series of articles describing the evolution of the UI redesign of Microsoft Office. Interesting stuff. One or two journalists jumped the gum and came out with articles on the 2.22 release before it was made… the cheek! Yet another trigger-happy online journalist. I suppose that’s what you get when you have an ultra-predictable and transparent release cycle, with release notes collaboratively written in public. GNOME Do – one of those applications you think you’ll never use, and then you wonder how you ever lived without it. I just watched the presentation on the Microsoft Office ribbon that Miguel pointed to earlier and I have to agree with him that it’s a great presentation on application design methodology, well worth watching. There a related series of articles on the UI design in Jensen Harris’s blog which is also worth reading (at least, so far). Some amazing stuff in the article in particular was the amount of data collection they have done over the years – millions of clicks and keystrokes, yielding some surprising results that reinforce once more the lesson “we are not our users” (striking example: 80% of people save by clicking the floppy disk in the toolbar, only 20% of saves happen with the Ctrl-S keystroke). So, you’re an artist, and your favourite program (or combination of programs) isn’t in the programme. Why not offer yourself up as a sacrificial lamb on the altar of demos? In Greek mythology, Deimos was the god of dread or panic, which seems strangely appropriate. The word demonstration comes from the latin demonstrare, to explain completely. Monstrare in turn comes from monstrum, meaning “divine omen or wonder”. So we can think of a demonstration as a demystification. The word shares its roots with monster, meaning something we don’t understand. So demonstrations are dreadful affairs where we demystify monsters. If you feel up to the task of scaring off other people’s monsters with a big flashlight, sign up here to give a demo. It could be as simple as using Blender to create an animation, or as complicated as drawing a square in the GIMP. “There is no end to what you can accomplish when you don’t care who gets the credit” – not a new article, but the first time I have read it. I have to say, I’m feeling the fatigue too – there was a period (after I said “I don’t get it”), when I was spending a lot of time on Facebook (playing poker, mostly), and now I’ve pretty much kicked the habit. And I don’t miss it at all, any more than I miss dancing the Macarena. Another channel shuts for desktop Linux. It’s a pity, but this comes back every 5 years or so – WalMart has now twice been a leader in selling Linux pre-installed PCs. Rendez-vous 2013? Walmart stops selling Linux PCs in-store. I don’t get it though: “Wal-Mart sold out the in-store gPC inventory but decided not to restock, O’Brien said. The company does not reveal sales figures for individual items.” Did these things go too slowly? Every so often you come across an article that points out a utility you’d never heard of, which turns out to be a Godsend. How did I miss powertop? 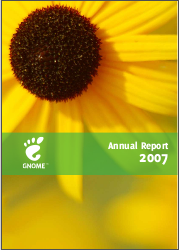 I just ordered a hard copy of the GNOME annual report (PDF) from lulu.com. At €9.05 postage included it’s a little pricy for a 24 page printed document, so I’m expecting top quality. I almost backed out when I saw the final bill, but I figured that a good chunk of that is going to the foundation, so what the hell, I’m a happy guy. Congratulations to Lucas and all the others who made this possible this year. I’m honoured to have been listed in the credits, given that I did so little this year to help. Important update: I just heard back from Lucas that the reports are being printed at cost at Lulu; so €6 is the cost of printing the thing (€3 delivery on top for Europe), and nothing is going to the foundation. Also, lulu doesn’t cancel orders under any circumstances. Not saying that you shouldn’t buy it, only that you should only do so if you think it’s decent value for money. Matt Webb, a keynote at this year’s GUADEC, gave a lightning talk presentation at the start of ETech this year. Here it is. Compliments for Orca, from late 2006. Good stuff.